Over the summer I finished the first draft of my next French YA novel, which, in stark contrast to the ones before, is not grim and dark but comical and light. And while my first two YA books take place entirely in Paris - and in places I know very well, including my old high school - this one narrates a road trip between the city of Bourg-en-Bresse (just a few kilometres from South Burgundy) and Paris. 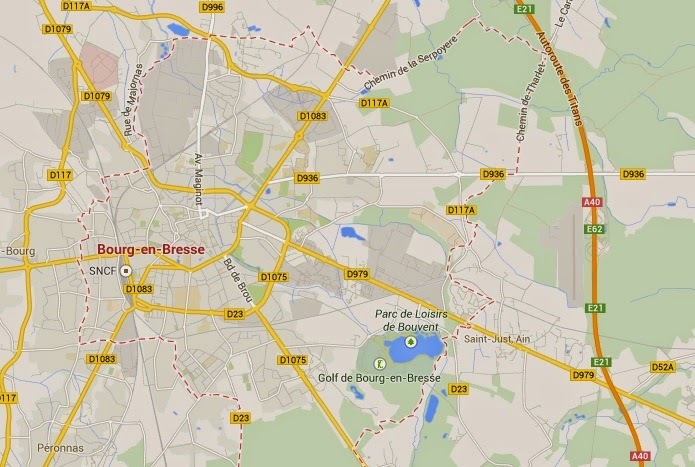 I know Bourg-en-Bresse and Paris well, but not the places in the middle, through which my three heroines were cycling. And that's where Google Street View comes into play. Well, sure, most of us would always privilege going to the real-world places, and some writers would not dream of writing about a place they'd never visited. There are obvious issues of cultural sensitivity at stake - 'would I truly respect the place, understand it, if I've only seen it through a 360° camera strapped to a car?'. There's the temptation of information overload, at the risk of ending up sounding like Jules Verne. And of course there are issues about the fact that the material given is exclusively visual, sacrificing the characteristic noises and smells which give life and texture to a place. A lot of writers would thus probably say that Street View should preferably be used only for quick fact-checking after seeing a place IRL (In Real Life). But maybe there's something specific, and not necessarily inferior, to writing about spaces that you know only from Street View, in exactly the same way that doing a painting from a photograph is different, but not necessarily inferior, to painting from life. Ideally, painters begin with life-drawing; and similarly, as writers, we would already have written about spaces that we know intimately: we've had, so to speak, considerable training in 'life-writing'. In the most restricted sense of 'write what you know', this is the first skill to master as a 'representer' of things, whether verbal or visual. But of course 'write what you know' is underscored by the problematic assumptions that 1) we 'know' things, 2) we 'can' write those things that 'we know' and 3) even if both of the above are true, it makes for good artistic 'representation'. Enter Google Street View, which presents a relentlessly artificial, 2D, unknowable vision of space. Just as photographs flatten reality and necessarily restrict the painter's visual and sensory navigation of the object to be represented, writing from Street View means subjecting yourself to an already mediated, stiff and alienating representation of space. How could anyone possibly argue that can be a good thing? Because, in both cases, it alerts the painter or the writer to the fact that the material cannot possibly provide a truthful kind of 'knowledge' about the object at all. Therefore it becomes not just desirable but absolutely imperative for something more to emerge - a stylisation, an appropriation of the object or the place. And this process comes from a source material so limited, so other, that you can't revert back to things you think you know. In other words, you just can't ignore, when you're writing a place from Street View (or indeed any travel guide book, like Verne used to do), that your vision of it is absolutely untrue. You just know you don't know it enough to write authentically about it; therefore, the only way you can go is towards further imagining that place. You have to make these impersonal snapshots of roads and monuments somehow become part of an authentic-sounding world. What must it smell like, this little pond on the side of the road? What must it feel like, this avenue, in the summer? This creative distance is necessary anyway to any writing about place, whether or not you've been there, lived there, or not at all. You might feel you know your house, your street, your city, but of course your vision of them will always already be mediated - by yourself. The troubling difference, with Street View, is that someone else (someone totally faceless, nameless and in fact quite uncannily threatening) has done the mediating for you, placing you by necessity in a position to notice your alienation from this place. Writing place 'from Google Street View' is of course not the only way we should proceed - that would be an absurd claim - but it can be a very refreshing endeavour in its own right - and a welcome process of distance-taking from 'truthfulness' in writing. Clementine Beauvais's space is split between Britain and France. She writes books in French of all kinds and shapes for all ages, and in English humour/adventure series, the Sesame Seade mysteries, with Hodder, and the Holy-Moly Holiday series with Bloomsbury. She blogs here about children's literature and academia and is on Twitter @blueclementine. "But of course 'write what you know' is underscored by the problematic assumptions that 1) we 'know' things, 2) we 'can' write those things that 'we know' and 3) even if both of the above are true, it makes for good artistic 'representation'." I think those are very good points! In a different context, Mallorie Blackman the Children's Laureate has been talking about the need for more diversity in children's books, including in the ethnicity of the characters, and I think part of the reason there isn't much diversity is that writers are often nervous about "trespassing" into any kind of territory - including cultural - that they haven't experienced directly. Hahaha Stroppy I'd give anything to be able to look at your Google history. Archive it carefully, as historians of literature of the future are likely to be very interested. Yes Emma I completely agree -and though such self-censorship comes from an ideologically very commendable worry, it's a shame that intelligent and sensitive people are not tackling themes (and talking about places) that they would do a very good job of rendering. Fascinating post and I loved those wide-angled road views that add a lonely kind of distance to the space. I've two experiences of setting stories in places I've never visited. One particularly place was so remote Google seemed not to have reached it as the map became more and more vague. I felt a bit like a cheat but if you're writing about the deadliest frog in the heart of the Colombian forest and cocaine plantations run by guerillas... what can a writer do? At least I didn't make the mistake of a reviewer who referred to the 'gorilla's' cocaine plantations. I don't think i'd like anyone to research my Google history as they'd firmly believe I was a drug dealer.